Nancy Rose (Jackson) Nickell, formerly a long-time resident of Frenchburg, passed away peacefully at St. Claire HealthCare in Morehead on January 29, 2019. 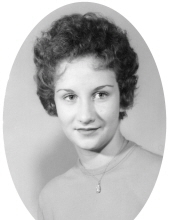 Nancy was born in Menifee County on September 3, 1947 and grew up playing on the farms of Igo Ridge. Nancy married the love of her life, Carl Nickell in 1964. They settled in Menifee County where they raised their son Mark. Nancy was a devoted and loving mother and wife. She was very proud of her family and was excited to become a "Granny" to her two grandchildren. Nancy loved family get-togethers at her home. Any chance to spend time with her family was joyful to her. She would spend hours cooking and preparing for her company. Preceding her in death were her parents, Rollie and Ethel Lou (Lawson) Jackson, and sisters, Mary Setters and Barbara (Clay) Landsdale. She is survived by her husband Carl Nickell; son Mark (Melissa) Nickell; loving grandchildren John Nickell and Olivia (Zach) Hacker; siblings Princess Setters, Lowell Jackson, John (Lee) Jackson and Shannon (Carl) Hartgrove; numerous nieces, nephews, extended family and friends. The family would like to thank the doctors, nurses and staff at St. Claire, the Life Care Center of Morehead, and Edgewood Estates in Frenchburg for the love and care they've given over the past four years. In lieu of flowers, memorial donations may be made to Korea Church of God or Better Life Church. Family and friends will gather at Korea Church of God, 7435 Highway 1693, Wellington, KY 40387 on Saturday, February 9, 2019, for a memorial fellowship from 11 a.m.-1 p.m., immediately followed by a memorial service at 1 p.m.
To send flowers or a remembrance gift to the family of Nancy Rose Jackson Nickell, please visit our Tribute Store. "Email Address" would like to share the life celebration of Nancy Rose Jackson Nickell. Click on the "link" to go to share a favorite memory or leave a condolence message for the family.